Many of us have been diligently planting milkweeds for Monarchs, seeking to provide critical egg-laying sites for the female butterflies and an essential food source for the caterpillars (see Monarch Joint Venture: Create habitat for Monarchs). We have, in fact, been encouraged to plant milkweeds just about anywhere we can – on lands both private and public, small and large. According to recently published research, female Monarch butterflies have preferences for egg-laying sites. For 2 years, a team of researchers working out of the University of Guelph studied Monarch egg-laying patterns in southern Ontario. In that region, they found that female Monarch butterflies prefer small milkweed patches over large ones and farmland over roadside plantings. 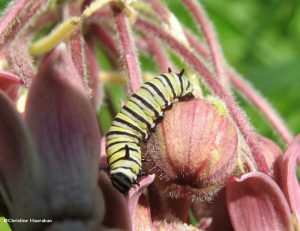 Read more here: Not all milkweed is equal for egg-laying Monarchs (University of Guelph) and What monarch butterflies prefer (EarthSky).